A leave-in hair conditioner is a great alternative to the shampoo followed by a conditioner routine. There are a few reasons a spritz of a leave-in conditioner may be a better idea. 1. Sometimes applying a commercial conditioner may be more than your hair needs and you end up with limp, weighed down, drab hair. 2. Dry hair, brittle ends, split ends are a common problem due to styling, weather, perms or color treatments. Deep oil treatments are ideal but for those in between days when time is an issue, spray conditioners are great. 3. Spray on a conditioner before blow drying to help prevent the drying damage from excess heat. 4. Spray on damp hair after washing to help with the tangles. 5. Safe to use for children to make combing out less of an ordeal. 6. Spray on dry hair, scrunch it in for that's it. 7. Steering away from chemicals and synthetics is just plain good for you and your hair. 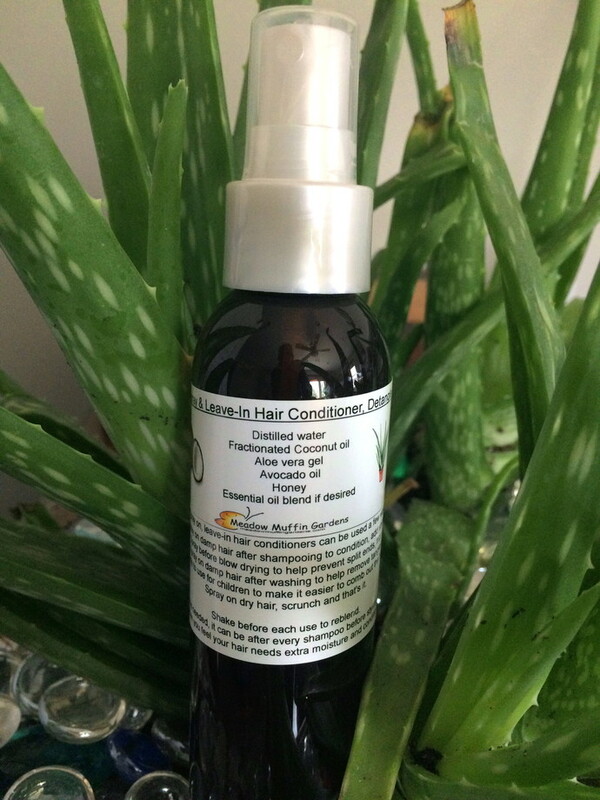 The ingredients used for this spray are to help protect from breakage and nourish the hair. Known for its ability as a hydrator to help skin and hair retain moisture, coconut oil is an excellent hair oil for all hair in need of repair, but especially beneficial for people with more porous hair. Because of the fact that coconut oil is a solid at temperatures below 75 degrees, for this blend I use fractionated coconut oil. Basically, it is a fraction of coconut oil from which almost all the long chain triglycerides are removed. What is left are mainly the medium-chain triglycerides which are made up of Capric acid and Caprylic acid. These acids give it more of an antioxidant and disinfecting effect, but the purpose I wanted for this spray was that it remain a liquid. The gel found inside the leaves of the aloe vera plant is excellent for moisturizing both the skin and the hair. It attracts moisture and seals it in. Very soothing and full of minerals needed by both the scalp and hair. A rich penetrating oil, wonderful for dry hair to rejuvenate and moisturize. Being a good source of proteins and amino acids, avocado oil helps hair stay strong and healthy. Honey is a humectant, which means it attracts and holds in moisture. Honey smooths out the frizzies and adds shine. You choose at checkout what essential oil blend you would like. If you would like something other than the choices offered, just let me know. Essential oils such as lavender, rosemary, grapefruit, lemongrass, basil. 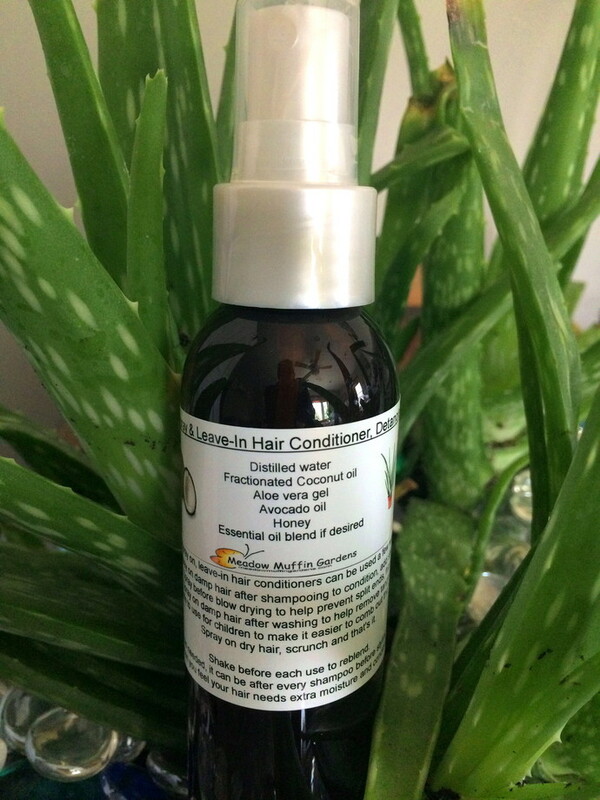 patchouli, geranium, peppermint, lemon, chamomile and sandalwood are all good for hair health and growth. Lemon and chamomile may even add a little lightening, especially if out in the sun. Plus it is really nice to catch a whiff of those scents throughout the day. If you do not want any essential oils added then choose "no essential oils". Be sure to shake the bottle before each use. Without synthetic emulsifiers, the oils will separate from the water/aloe and float to the top. Experiment with how much to use at a time. Containing oils, too much can make your hair look greasy. How often you use the spray is up to you. It all depends if you need it to remove tangles every time you shampoo or just for those periods where you feel your hair is getting dry or brittle and needs a little help. Available in a 2 oz. or 4 oz. bottle. You choose at checkout. "Fractionated coconut oil is created by melting coconut oil and then letting it cool very slowly. The different kinds of fats in the oil will separate based on their differing melting points. This is a physical separation process, no chemical reactions occur. Sometimes a centrifuge is used to help in the separation. Fractionated coconut oil typically refers to the liquid portion of the coconut oil that has been separated from the harder fats. This liquid is commonly used as a carrier oil for aromatherapy, in cosmetic items as an emollient, and in massage. The solid portion can then be used for further processing to create things like stearic acid, or sold raw to make things like coconut "wax" candles."